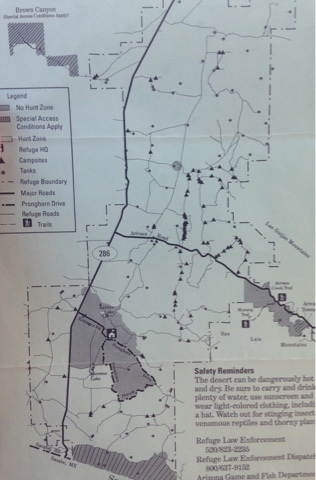 I picked up this tri-fold paper of the Buenos Ares National Wildlife Refuge "Public Use Regulations" with a map of roads and camping locations. See separate post about Buenos Ares NWR and Sasabe, AZ. 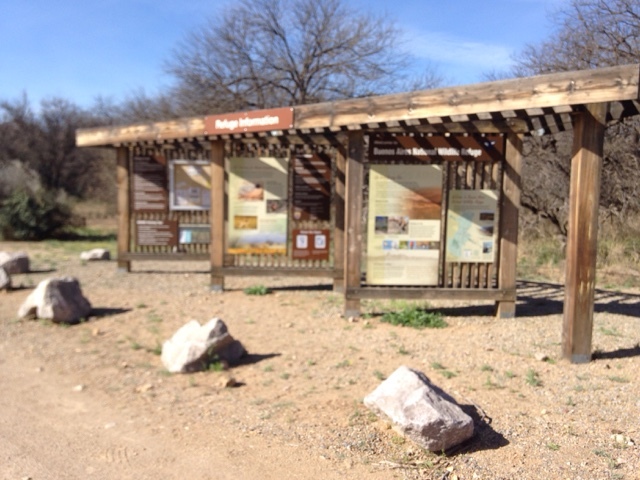 Here is the kiosk I picked up the map just west of Arivaca. 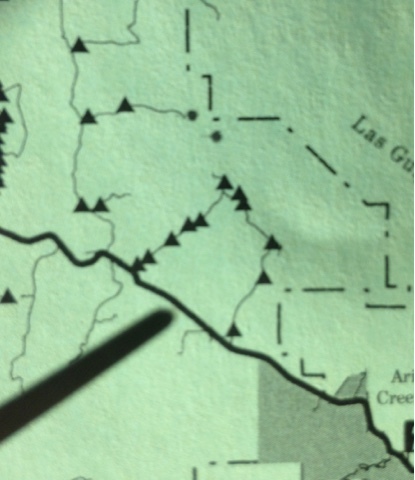 Zooming in on Arivaca- Sasabe Road the triangles on the map are campsites. In the NWR you can only camp in designated campsites. There are over 100 and they are all numbered. 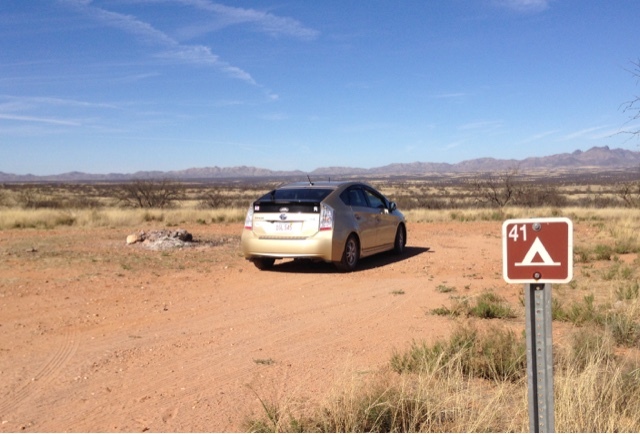 This loop camping area where I have a pointer is a road with gates at both ends where it meets the Sasabe-Arivaca Road. The gates are not locked and you can open them to get to the campsites. You need to close the gate after passing. Further to the west there is a north south road with a number of campsites. There are no gates on the entrances. This is where I went to campsite 41 north of the main road. At this National Wildlife Refuge there is no cost to camp and no registration, but there is a 14 day limit. There were no other campers that I saw in this area. Although I didn't stay the night I could have and it was a nice camp spot with wonderful views as I was on a bluff. 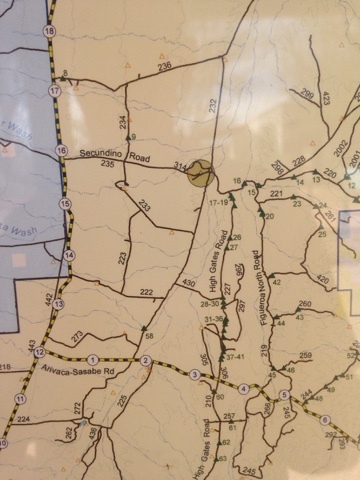 The paper map I got from the kiosk doesn't have mile markers and it is exceedingly difficult to find the sites not knowing what road is what. At the visitor center they sell the better map for $5.00 but it was also under glass on a poster board and I took pictures. 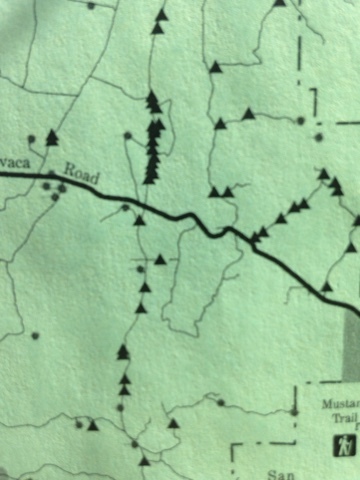 This better map also has the road numbers that help as there are small sign posts with the numbers at the intersection of the road. Not all campsites are Prius clearance friendly. This noted I didn't have a hard time finding a site, but at times one side of my Prius I was riding the crown in the road not to bottom out. I didn't stay as I didn't have cell data but did have phone service. My cell phone amplifier picked up a signal called tele. Since it didn't come along with the normal text message, "welcome to Mexico" I was guessing I may have a signal from tohono o'odham nation. I know in northern AZ when connected to a reservation cell site the agreement with AT&T does not allow much data, but you do get text and voice. Since I blog a lot I do like to have access to data that will allow me to post my blog. Of course the use of WIFI is best to save my data. There was no local WIFI so plan accordingly.